Hiya, Welcome to the CC, the place where chocolate dreams are made and come true. My best friend Ted’s birthday is coming. For his 40th birthday, and after more than 30 years of friendship, I’ve decided to make him a special gift. Knowing how much he likes sweets and even more the Star Wars movies, I’ve come up with an idea to create a special atmosphere and ambience that he will remember! I bought the tickets for the premiere of “Star Wars Rogue 1”. And today I made exactly this kind of cake – Dark Chocolate Cake. 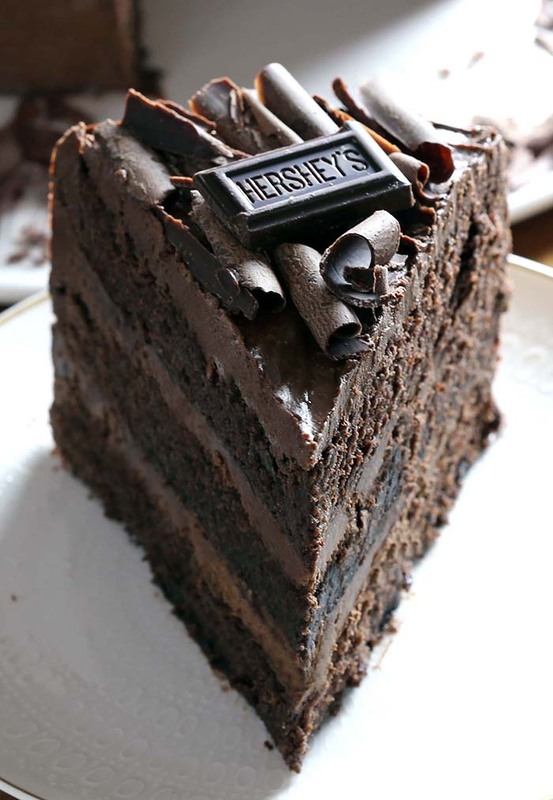 As soon as the movie ends, I know Ted will expect that we go and eat cake just like every time and I’ll invite him over our house to try Hershey’s Dark Chocolate Cake. Bake for 30 to 35 minutes or until wooden pick inserted in centre comes out clean. Cool in pans for 10 minutes. Remove cakes from pans to a wire racks and let to cool completely. Beat butter in medium bowl until fluffy. Add powdered sugar and cocoa alternately with milk, beating to spreading consistency. If necessary, add a bit of milk to reach desired consistency. Stir in vanilla. You will get about 2 cups of frosting. Place first layer of cake on cake plate. Spread about ½ cup of frosting on top in an even layer. Add second layer of cake and add frosting on top in an even layer. Add final layer of cake on top and frost the outside of the cake. Finish off with chocolate curls or other decoration, and set in a fridge for a few hours before serving.